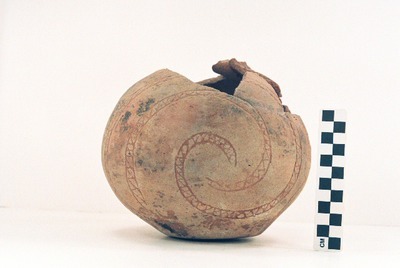 "41AN26 - 15" by Timothy K. Perttula and Robert Z. Selden Jr.
DECORATION (INCLUDING MOTIF AND ELEMENTS WHEN APPARENT): The vessel body has one set of cross-hatched hooked arm zones and another set of cross-hatched engraved spirals. These elements are divided by two intersecting diagonal cross-hatched zones. Poynor Engraved, var. unspecified bottle from the Richard Patton site.